At Citrus Australia, we recognise quality is important and that is why we have developed a simple set of standards outlined in the following manual. Called the Australian Citrus Quality Standards, they aim to assist growers, packers, marketers and retailers deliver quality citrus that Australian consumers can enjoy with confidence. We aim to assist you in keeping your valuable consumers happy and coming back for more! Download the final report on Management of internal dryness of Imperial mandarin (PDF 2,189kb) – This project has been funded by HIA using the Citrus levy and matched funds from the Australian Government. An “in kind” contribution was also made by the Queensland Government who were the Service provider on this project. 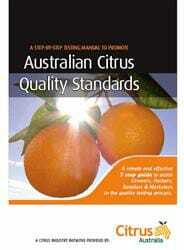 Below is the Australian Citrus Quality Standard Calculator for maturity of Mandarins and Oranges. Please note you need to log in to access this.